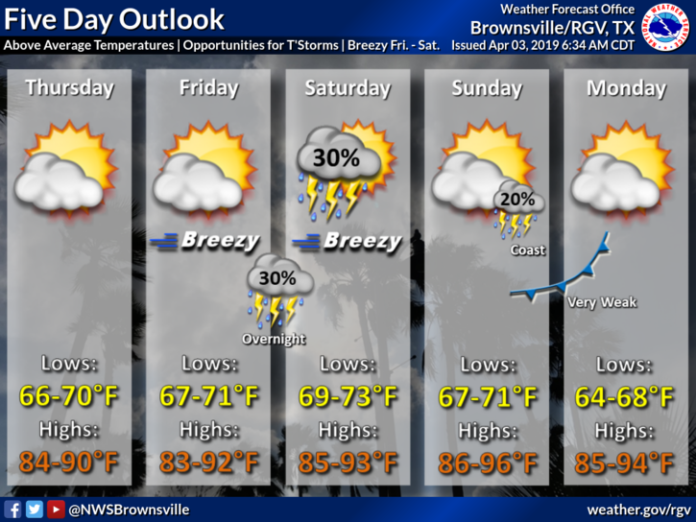 A warmer day is expected Wednesday in the Rio Grande Valley as temperatures return to near average for this time of year, according to the National Weather Service in Brownsville. There is a chance for scattered rain Wednesday with a possibility for a few rumbles of thunder in the lower to mid-Valley. Brownsville will reach 80 while McAllen is expected to be 82. South Padre Island will be cooler at 73. Looking ahead, temperatures may hit the 90s in some parts of the Valley for the rest of the week. Be prepared for a chance for rain and some thunderstorm from Friday into Sunday. Partly cloudy to partly sunny skies are expected to rest of the week, and winds will become breezy Friday and Saturday.